Every action has a consequence, but not every consequence can be known ahead of time. The political subplot caught me by surprise. I knew this was a serial when I began reading it, but I wasn’t expecting to be nearly as interested in how a society decides who is and isn’t valuable when the human race is threatened with extinction as I was in the deadly virus.The foundation has been set for a great series. I’m looking forward to seeing what the author does in book two. David and Amanda definitely have chemistry, but their relationship heated up way too quickly. I don’t have a problem with characters becoming intimate early on in their relationship. There is a big difference between being wildly attracted to someone and believing that they’d make a good life partner, though, so it would have been helpful had they been more aware of which one they were actually feeling as they got to know one another. The premise of this novella caught my attention immediately. I’ve always liked stories about pandemics. The unique twist on this one intrigued me even more since there was a recent real-life case of an ancient virus being discovered in melting permafrost. It’s such a scary scenario! By far the most interesting scenes involved Amanda’s race to figure out how – or if – she can stop this one before it’s too late. Every time she uncovered another clue I had no choice but to keep reading until I knew what she’d do with it. 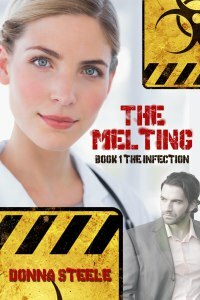 I’d recommend The Melting Book 1, The Infection to anyone who enjoys the medical side of science fiction.